Afonso VI (Portuguese pronunciation: [ɐˈfõsu]; 21 August 1643 – 12 September 1683), known as "the Victorious" (o Vitorioso), was the second King of Portugal of the House of Braganza from 1656 until his death. He was initially under the regency of his mother, Luisa of Medina-Sidonia, until 1662, when he removed her to a convent and took power with the help of his favourite, the Count of Castelo Melhor. Afonso's reign saw the end of the Restoration War (1640–68) and Spain's recognition of Portugal's independence. He also negotiated a French alliance through his marriage. However, the king was physically and mentally weak. In 1668, his brother Pedro conspired to have him declared incapable of ruling, and took supreme de facto power as regent, although nominally Afonso was still sovereign. Queen Marie Françoise, Afonso's wife, received an annulment and subsequently married Pedro. Afonso spent the rest of his life and reign practically a prisoner. At the age of three, Afonso suffered an illness that left him paralyzed on the left side of his body, also leaving him mentally unstable. His father created him 10th Duke of Braganza. After the death of his eldest brother Teodósio, Prince of Brazil in 1653, Afonso became the heir apparent to the throne of the kingdom. He received also the crown-princely title 2nd Prince of Brazil. Portrait of Infante Afonso; José de Avelar Rebelo, 1653. He succeeded his father (João IV) in 1656 at the age of thirteen. His mother, Luisa of Medina-Sidonia, was named regent in his father's will. His mental instability and paralysis, plus his lack of interest in government, left his mother as regent for six years, until 1662. Afonso oversaw decisive military victories over the Spanish at Elvas (14 January 1659), Ameixial (8 June 1663) and Montes Claros (17 June 1665), culminating in the final Spanish recognition of sovereignty of Portugal's new ruling dynasty, the House of Braganza, on 13 February 1668 in the Treaty of Lisbon. 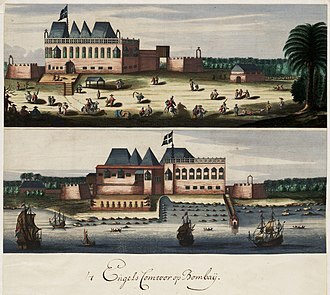 Colonial affairs saw the Dutch conquest of Jaffnapatam, Portugal's last colony in Portuguese Ceylon (1658) and the cession of Bombay and Tangier to England (23 June 1661) as dowry for Afonso's sister, Catherine of Braganza, who had married King Charles II of England. 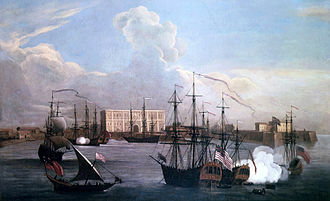 English mediation in 1661 saw the Netherlands acknowledge Portuguese rule of Brazil in return for uncontested control of Ceylon. In 1662, the Count of Castelo Melhor saw an opportunity to gain power at court by befriending the king. 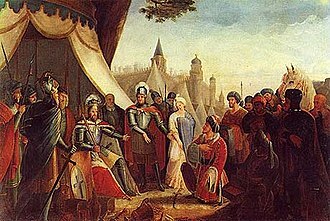 He managed to convince the king that his mother was out to steal his throne and exile her in Portugal. As a result, Afonso sent his mother to a convent. Afonso married Marie Françoise of Nemours, the daughter of the Duke of Savoy in 1666, but the marriage was short-lived. Marie Françoise, or Maria Francisca in Portuguese, filed for an annulment in 1667 based on the impotence of the king. The Church granted her the annulment, and she married Afonso's brother, Pedro, Duke of Beja (the future Peter II). King Afonso VI imprisoned in the Palace of Sintra, by Alfredo Roque Gameiro. That same year, Pedro managed to gain enough support to force Afonso to relinquish control of the government to him, and he became Prince Regent in 1668. While Pedro never formally usurped the throne, Afonso was king in name only for the rest of his life. (The proceedings which the annulment of Afonso's marriage involved formed the basis of João Mário Grilo's 1989 film, The King's Trial [O Processo do Rei].) For seven years after Pedro's coup, Afonso was kept on the island of Terceira in the Azores. His health broken by this captivity, he was eventually permitted to return to the Portuguese mainland, but he remained powerless and kept under guard. At Sintra he died in 1683. ^ Chisholm, Hugh, ed. (1911). "Alphonso s.v. Alphonso VI." . Encyclopædia Britannica. 1 (11th ed.). Cambridge University Press. p. 734. Alfredo Roque Gameiro was a Portuguese painter and graphic artist who specialized in watercolors. When he was ten years old, he went to live in Lisbon with his oldest brother, Justin and he studied at the Faculty of Fine Arts of the University of Lisbon, where José Simões de Almeida was one of his professors. After receiving a scholarship from the Portuguese government, he attended the Hochschule für Grafik und Buchkunst in Leipzig and studied lithography with Ludwig Nieper. Upon returning to Portugal in 1886, he became the Director of the Companhia Nacional Editora and and he was a frequent contributor to several weekly and monthly periodicals and worked with Manuel de Macedo to provide illustrations for a deluxe edition of The Lusiads, published in 1900. From 1910 to 1920 he created 10 watercolors and 90 lithographs for what would be his most popular work, Lisboa Velha and he illustrated several popular novels by Júlio Dinis. In 1919, he became the first Director of the Escola Secundária Artística António Arroio, the following year, he and his daughter Helena had a successful joint exhibition in Brazil. Slaves, especially those brought from Africa, provided most of the working force of the Brazilian export economy after a brief period of Indian slavery to cut brazilwood. The boom and bust economic cycles were linked to export products and diamonds were discovered and mined in southern Brazil through the end of the colonial era. Brazilian cities were largely port cities and the administrative capital was moved several times in response to the rise. Unlike Spanish America that fragmented in many republics, Brazil remained as an administrative unit with a monarch. Like Spanish America with European Spanish, Brazil had linguistic integrity of Portuguese, both Spanish America and Brazil were Roman Catholic. The Portuguese identified brazilwood as a red dye and an exploitable product. Its maritime exploration proceeded down the coast of West Africa and they sought the sources of gold and African slaves that were high value goods of the African trade. The Portuguese set up fortified trading factories, whereby permanent, fairly small commercial settlements anchored trade in a region, the initial costs of setting up these commercial posts was borne by private investors, who in turn received hereditary titles and commercial advantages. From the Portuguese crowns point of view, its realm was expanded with relatively little cost to itself, the most decisive of these treaties was the Treaty of Tordesillas, signed in 1494, that created the Tordesillas Meridian, dividing the world between those two kingdoms. All land discovered or to be discovered east of that meridian was to be the property of Portugal, the Tordesillas Meridian divided South America into two parts, leaving a large chunk of land to be exploited by the Spaniards. The Treaty of Tordesillas was arguably the most decisive event in all Brazilian history, the present extent of Brazils coastline is almost exactly that defined by the treaty of Madrid, which was approved in 1750. 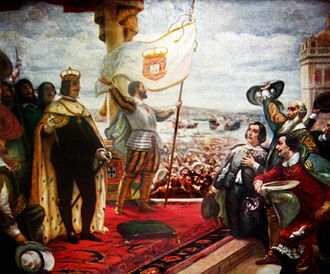 On April 22,1500, during the reign of King Manuel I, although it is debated whether previous Portuguese explorers had already been in Brazil, this date is widely and politically accepted as the day of the discovery of Brazil by Europeans. Álvares Cabral was leading a fleet of 13 ships and more than 1000 men following Vasco da Gamas way to India. The Pantheon was created under orders from Ferdinand II of Portugal, transforming the old refectory of the monastery into the burial place it is today. The majority of the tombs are located on the sides of the pantheon, if the tomb is of a monarch, it has a crown engraved in gold on the side of the tomb and a crown placed on top of the entire set of tombs. However, she was never buried in the Braganza Pantheon, and his heart is interred in the Church of Our Lady of Lapa, in Porto, Portugal. She subsequently remained in Brazil with her husband, and became Empress Consort of Brazil when Pedro proclaimed the independence of Brazil and was acclaimed as Emperor Pedro I. When Pedro briefly held the Portuguese Crown as Pedro IV from March to May,1826, Empress Maria Leopoldina became Queen Consort of Portugal. She died in December 1826, before her remains were transferred to the Monument to the Independence of Brazil in 1972, was buried in the Convent of Santo Antônio in Rio de Janeiro. Queen Consort Maria Pia, consort of King Luís I of Portugal, is buried in the Pantheon of the House of Savoy in the Basilica of Superga in Turin, Italy. Terceira is an island in the Azores archipelago, in the middle of the North Atlantic Ocean. It is one of the islands of the archipelago, with a population of 56,000 inhabitants in an area of approximately 396.75 square kilometres. A small number of hypogea were discovered on the island of Terceira, indicating a history of settlement that may date back 2000 years, there has been uncertainty in the date and the discoverer associated with the islands of the Azores. In 1439, the first official discovery document appeared, attributing the discovery of the Formigas to Gonçalo Velho Cabral, regardless, it was only a temporary name, as the colloquial Terceira was used more often to describe the island. The colonization of the island began by decree of Infante D. Henrique and its first settler was Fernão dUlmo, a Flem or Frenchman, who abandoned his plot, for unknown reasons. The first settlement occurred in Quatro Ribeiras, in the locality of Portalegre, Bruges made return trips to Flanders for new settlers to his colony. On one of his trips to Madeira, he conscripted Diogo de Teive and assigned him as his Lieutenant and Overseer for the island of Terceira. Following his disappearance, the Infanta D. Beatriz, in the name of her son the Infante D. Diogo divided the island of Terceira into two captaincies and Praia. This development would continue until the end of the 19th century, with the introduction of new products, including tea and pineapple. During the Portuguese succession crisis of 1580, the Azores was the portion of the Portuguese overseas empire to resist the Spanish until the summer of 1583. 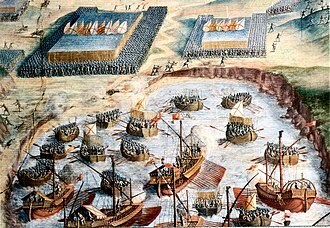 Philip II of Spain had offered an amnesty if the Azores surrender, with a fleet to ninety-six ships and 9,500 men the Marquis was able to defeat the forces of D. António after one days fighting. Although French and English soldiers on the island were allowed to retire unharmed, antonio and a handful of his supporters were lucky to escape with their lives. With the acclamation of John IV of Portugal, the Azores applauded the restoration of independence from the Iberian Union, in 1766, the reorganization of system of Captaincies was undertaken, resulting in one Captain-General, with his seat in Angra do Heroísmo for the Azores. Ribeira Palace was the main residence of the Kings of Portugal, in Lisbon, for around 250 years. Its construction was ordered by King Manuel I of Portugal when he found the Royal Alcáçova of São Jorge unsuitable, the palace complex underwent numerous reconstructions and reconfigurations from the original Manueline design, ending with its final Mannerist and Baroque form. The Ribeira Palace, as well as most of the city of Lisbon, was destroyed in the 1755 Lisbon earthquake, Lisbons primary square, the Praça do Comércio, is situated on the site of the former palace. The square is popularly referred to as the Terreiro do Paço. The groundbreaking of the palace was in 1498, Ribeira palace was situated next to the Ribeira das Naus shipyard and near all the major Lisbon trading houses. In 1502, the palace had been large enough so that the Portuguese Royal Court could begin moving into the palace. In 1508, King Manuel I started expansion works on the palace, which ended in 1510, the palace of King Manuel I, and his successors until King Henry I of Portugal, was a true palace of the Portuguese Renaissance. Done in the Manueline style, among others, the palace included various wings, balconies and courtyards. The main loggia of the palace, facing the Terreiro do Paço, followed the style employed by King Manuel I at many of his palaces, most notably at the Royal Palace of Évora. The hallmark of the palace, not just in the Manueline era but in all its history, was its Tower of the King, in the southern wing. During the Manueline era, the Casa da Índia was installed in the tower and it was during the Manueline era, when the House of Aviz ruled Portugal, that the Portuguese Renaissance truly flourished, and Ribeira Palace was one of its centers. It was a beacon for artists, scientists and noblemen from all over Portugal and it was at Ribeira Palace, in 1515, that Gil Vicente, the father of Portuguese and Spanish theatre, first performed his play Quem Tem Farelos. for King Manuel I. The palace was almost completely destroyed in the 1531 Lisbon earthquake and had to be rebuilt. To better suit Lisbon for King Philip Is extravagant court, the King ordered the remodeling and expansion of Ribeira Palace, under the authority of Filipe Terço, the Master of the Royal Works. Jaffna is the capital city of the Northern Province of Sri Lanka. It is the headquarters of the Jaffna district located on a peninsula of the same name. With a population of 88,138, Jaffna is Sri Lankas 12th largest city, jaffnas suburb Nallur served as the capital of the four-century-long medieval Jaffna kingdom. Prior to the Sri Lankan civil war, it was Sri Lankas second most populated city after the commercial capital Colombo, the 1980s insurgent uprising led to extensive damage, expulsion of part of the population, and military occupation. Since the end of war in 2009, refugees and internally displaced people have started to return to their homes and government. Historically, Jaffna has been a contested city and it was made into a colonial port town during the Portuguese occupation of the Jaffna peninsula in 1619 who lost it to the Dutch, only to lose it to the British in 1796. And during the civil war the rebel Liberation Tigers of Tamil Eelam occupied Jaffna in 1986. The Indian Peace Keeping Force briefly occupied the city in 1987, the LTTE again occupied the city from 1989 until 1995, when the Sri Lankan military regained control. The Battle of Montes Claros was fought on 17 June 1665, near Vila Viçosa, between Spanish and Portuguese as the last major battle in the Portuguese Restoration War. It was a great Portuguese victory and is considered as one of the most important battles in the countrys history, by 1665, the Portuguese Restoration War had been raging for 25 years. 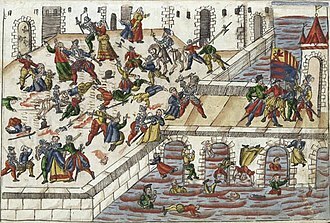 Despite numerous setbacks, King Philip IV of Spain was determined to crush the Portuguese insurrection, the court believed that the insurrection could only be ended by the capture of a major city or by the complete destruction of the Portuguese Army. Luis de Benavides Carrillo, Marquis of Caracena, a veteran of campaigns in Italy, Carrillo had served as a field commander and as a military governor, and his organizational skills were lauded. Carrillo planned to end the war by capturing the Portuguese capital of Lisbon, to reach the city, he planned first to take Vila Viçosa, followed by Setúbal. Once he was in command, Carrillo wanted to gather strength to ensue that he outnumbered the opposing Portuguese Army. 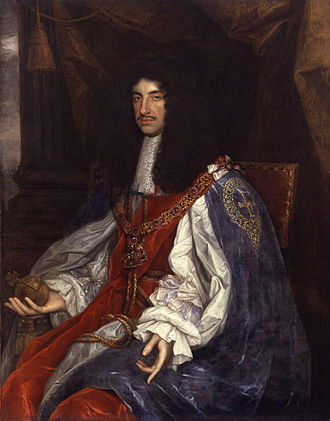 However, the illness of King Philip caused the court to him to procede with the invasion. The Spanish crown was facing financial difficulties, and there was a fear that the army would be disbanded if the war continued. The Portuguese were prepared and had such an attack. 3,500 men were moved from Trás-os-Montes in the north to Alentejo in the south, a further 7,800 men came from Lisbon, under command of António Luís de Meneses, who had beaten the Spanish in the Battle of the Lines of Elvas six years earlier. They were reinforced by a veteran English contingent of 2,000 men under the command of the Duke of Schomberg. A veteran commander who had been defending the Portuguese border for over 20 years, as such, he reinforced the border garrisons of Elvas and Campo Maior, hoping to harden the frontier defenses and in doing so influence the route Carrillo would take. The Portuguese were conscious of the health of the Spanish King. Carrillos army moved into Portugal on 25 May and he first took Borba without resistance after it was abandoned by the Portuguese. The Battle of the Lines of Elvas, was fought on 14 January 1659, in Elvas, between Portugal and Spain during the Portuguese Restoration War. It ended in a decisive Portuguese victory, by 1659, the Portuguese Restoration War had been raging for 18 years and had degenerated into a stalemate. Other than minor cavalry raids, little fighting had occurred and neither the Spanish Hapsburg Army nor the Portuguese had managed to claim a decisive battlefield victory. The capture of Elvas and Fort Santa Luzia would allow the Spanish Army to proceed down the Estremoz road to the Portuguese capital of Lisbon if they so chose. 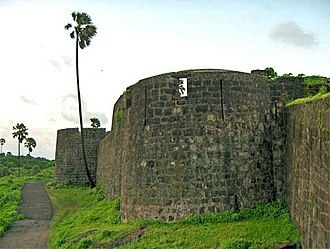 The Portuguese court was aware of the Spanish threat to the city and had reinforced the strength of the citys defensive fortifications during the course of the war. However, years of minor military action in the area had degraded the readiness of the garrison. In December 1658 a Spanish army commanded by D. Grandee Luis de Haro camped in the frontier of the Caia River with 14,000 infantry,3,500 cavalry, and several pieces of artillery. The Spanish preparation for the siege of Elvas took several days, time which the Portuguese used to prepare the city defenses. De Haro distributed his troops in trenches, giving orders to everyone that approached the city. The Spanish bombarded the city, causing panic and casualties among the civil population, the only way the situation could turn in favor of the Portuguese was with the help of a relief army. Queen-Mother Luisa de Guzman decided to call for António Luís de Meneses, Count of Cantanhede and she transferred to the same theatre of operations Sancho Manoel de Vilhena, who assumed the post of field marshal. Meneses, although facing extremely poor conditions, managed to gather an army in Estremoz. He organized recruitment efforts in Viseu and in the Madeira islands and united the garrisons of Borba, Campo Maior, Vila Viçosa, the gathered army had 8,000 infantry,2,500 cavalry, and seven cannons. The Portuguese left Estremoz and occupied the hill of Assomada, from where they could see the city of Elvas, when the Spanish cavalry moved to intervene, the limited Portuguese cannon fired into them. António Luís de Meneses, 1st Marquis of Marialva, 3rd Count of Cantanhede. English-made cavalry armour of Pedro II, King of Portugal, consisting of a cuirass, bridle-hand gauntlet, buff coat and 3-barred lobster tailed pot helmet. These are of very high quality. Portrait by António de Oliveira de Louredo; 1703, National Museum of Ancient Art. Personal Coat of Arms of Infante Luis, 5th Duke of Beja. The Coat of Arms of the Dukes of Beja. Duquesa D. Beatriz de Lencastre.